In 1736 the Contractor to the Naval Victualling Office built a wharf 350 long which had access by way of a flight of stone steps and a drawbridge. The gates as they stand today pierce the wall at the site previously known as the Ragged Staff Couvreport. The old Spanish fortification walls were breached to build the new Ragged Staff gate in 1843 for foot passage. The larger ones for traffic were built during the building of the Dockyard at the beginning of the 1900’s with the last smaller one built in 1921. The origin of the name Ragged Staff has long been a debatable topic with one of the most creditable being the fact that the wall where they are, was built by CharlesV Duke of Burgundy and the Ragged Staff s are part of his Arms. Those shown above the entrance to the old Southport Gate have no Ragged Staff s but there are other places where they are shown. The Landport Tunnel leads to the Landport Gate which has been the main land entrance into Gibraltar since the Moorish conquest. Throughout the years after many sieges and battle damage it has undergone many renovations and improvements. There was another gate further up called the Gate of Granada which was demolished after the siege of 1727 when the whole of the slope in front of the Northern Defences was scarped as it was seen as a weak spot in the defence of the fortress. The present Gate is much the same as it was during the Great Siege of 1779-83. It was through this tunnel and bridge on the 27th November 1781 that the combined forces of British and Hanoverian troops crept out stealthily to conduct the destruction of the Spanish Advance Works which were a great threat to the fortress. This feat is still remembered as “The Great Sortie”. The Landport Gate lost much of its importance following land reclamation in the 1800’s around the North Bastion when Casemates Gates became the new land entrance into the city. It was during the Spanish cycle of improvements to Gibraltar’s fortifications carried out on the instructions of Charles V and continued during the next 60 years, that the gate normally refer to as the Puerta de Mar first makes its appearance as an identifiable element in a contemporary maps and sketches. It is usually depicted as a more or less fortified structure just north of the Old Mole itself. It has been suggested that in 1804, the then Governor General Trigge was responsible for improving the gate. Whether this was true or not in 1824, John Pitt , Earl of Chatham the Governor at the ti me did have the original gate widened. In 1859 Major General Savage, the Commander of the Royal Engineers, opened a new entrance. 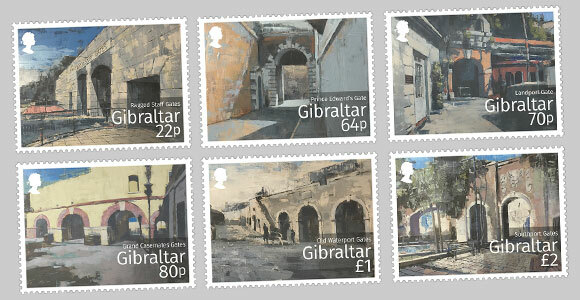 When the British took over the Gibraltar in the early 18th century, the entire line wall defences were further improved upon by a succession of British engineers such as William Skinner, William Green and James Montresor. Although maps suggest that various external changes to the single gate may have been carried out over the years, its actual position seems to have remained unchanged for pedestrians and twenty five years later in 1884 it was the turn of yet another Governor, Lieutenant General John Adye, to inaugurate a second gate beside the original one to ease traffic into and out of Casemates. A further pedestrian gate was added later. The gates came to be known as the “Grand Casemates Gates on site of Water Gate.” In 1902 a second vehicle gate was finally built to cope with extra traffi c and a year later the pedestrian gate was reconstructed presumably for aesthetic reasons. By the beginning of the 20th century with the advent of motor vehicles and a rapid increase in both tourism and commerce both sets of gates were finding it difficult to cope. In 1927, the authorities decided that something had to be done and hit on the rather drastic solution of demolishing the three Waterport gates as well as those sections of Chatham’s Counterguard which stood on either side of them.